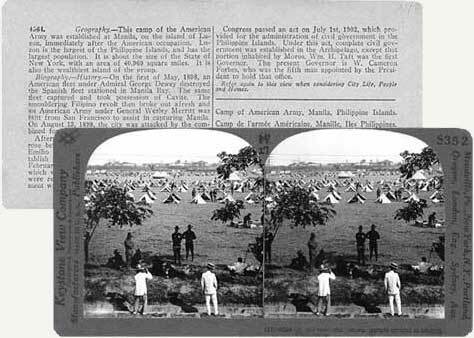 American army camp, Manila, Philippines. "The making of stereoscopic pictures is one of the most lucrative departments of photography, and the number and variety of subjects everywhere obtainable of the wonders of the world, together with the vast assortment of historical views, and local bits of interest, make a collection of endless extent and beauty." (A Practical Suggestion for Stereo-Landscape Negatives. Photographic Mosaics; an annual record of photographic progress. 1874, p. 121). The stereograph, or stereo view, consisted of a double set of paper prints mounted on card stock to be viewed through a stereoscope to produce a three dimensional image. They became a popular photographic medium in Europe in the mid-1800s, and through mass production methods became widely distributed in the United States by the 1880s. Stereographs reached their peak of popular distribution in the years 1902-1935 through the business efforts of such companies as the Keystone View Company and Underwood & Underwood. Underwood & Underwood was established at Ottawa, Kansas in 1882. They eventually moved to New York City in 1891. They originally operated as distributors of stereocards of Eastern views to new markets in the West. In 1895 they began producing packaged sets of views with descriptions earmarked for the education market. The Keystone View Co. was formed in 1892 in Meadville, Penn. by B.L. Singley, a former salesman at Underwood & Underwood. This company became the major publisher of stereographs in the world after 1920. In 1898 they organized their highly successful Education Department which produced boxed sets for school instruction of images and descriptive text illustrating culture, industry, commerce and politics world-wide. Although the company hired its own professional photographers, they also purchased rights to other negatives including several series of Underwood and Underwood negatives in 1912. Orders for Keystone sets continued to be filled by the company as late as 1970. B.W. Kilburn & Co. was started in Littleton, New Hampshire in 1876, by the Kilburn Brothers, Benjamin West and Edward Kilburn, and became one of the major publishers of sterographs at the turn of the century. After B.W. Kilburns demise in 1909, the entire set of Kilburn negatives were acquired by the Keystone View Co.
From the middle to late 19th century, Carleton E. Watkins photographed the landscape of the American West. He reproduced a number of his views in stereoscopic series. In 1867, he traveled to Oregon and produced more than 100 stereo images capturing local scenery especially of the Columbia River. His Pacific Coast Views were produced until about 1876 after which his landscape views were issued as Watkins New Series. The Continent Steroscopic Company operating in New York, produced stereocards from 1875-85. Most of these were Western scenes whose negatives were partly purchased and partly made for the company. Some of the well known photographers they represented were Watkins, O'Sullivan, Jackson and Haynes. This company also produced a small number of views of Sitka, Alaska around 1878. This digital collection is a selection of 171 stereographic views from our archival collections. They consist primarily of landscape and documentary views. In some cases, both front and verso views of a stereograph have been presented. The information for the Stereograph Collection was researched and prepared by the UW Libraries Special Collections Division and Cataloging staff in 2001. The images to create this database were drawn from three separate collections. Not all the photographs from these collections were included in this database. The images were scanned in grayscale using a Microtek Scanmaker 9600L and saved in .jpg format. Some manipulation of the images was done to present the clearest possible digital image. The scanned images were then linked with descriptive data using the UW Content program. The original collections reside in the UW Libraries Special Collections Division as Stereocard Collection no. 31, Stereocard Collection no. 58, and Stereocard Collection no. 372.